We flew with Ryan Air to Verona, a trip of under two hours yet it seemed to take up much of the day. This is why we like train travel, because so much time with air travel is taken up going through security checks and sitting in waiting rooms. It was with great trepidation that we booked on Ryan Air. They have a terrible reputation amongst travellers because their rules are applied so rigidly that it often seems totally unfair. We spend an hilarious half hour reading the complaints page at http://www.airlinequality.com/Forum/ryan.htm. Although we laughed a lot, we also were terrified by the time boarding time came in case we were excluded from the flight or were charged an extra 60 Euros for no apparent reason. In the end, we had a fine experience, perhaps because we had paid extra to book the exit row seats. An ordinary ticket doesn’t get you a booked seat and there is a bit of a mad scramble at boarding time to secure a seat with your partner. At Verona, we caught a cab to our hotel, nice little place called the Piccolo, which is handy to the centre and all the main sights. 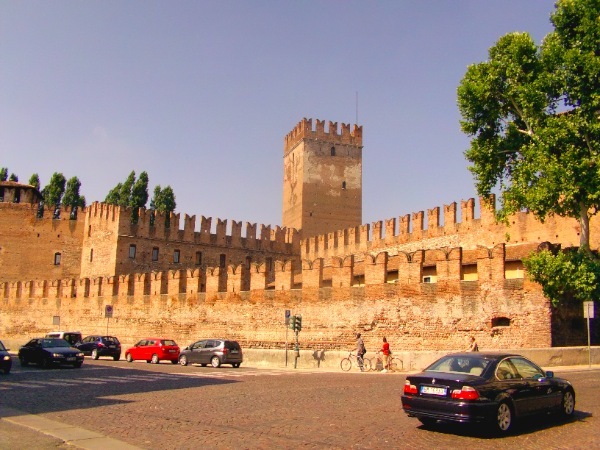 I think most hotels would fit the bill because the city is very compact, mostly still contained within the original Roman and medieval walls. Walking is an easy option here, although the heat in July means choosing a shady path where possible. Bikes are commonly available, including a ride and drop system, but the pedestrian density around the popular tourist zones can even make cycling difficult. 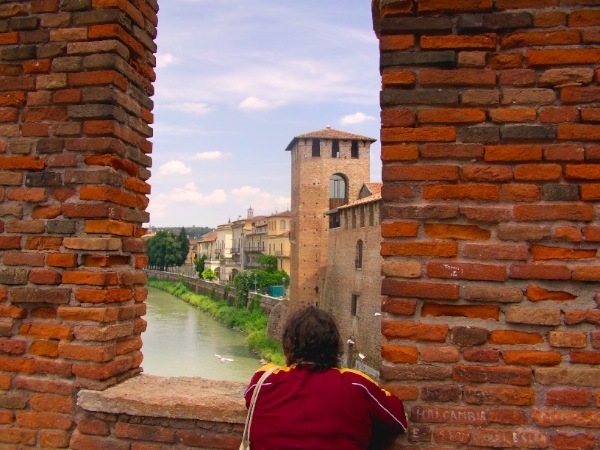 Verona is an extremely beautiful city. 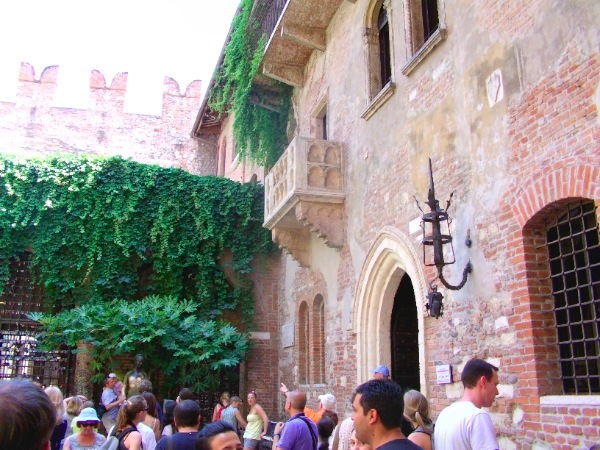 It is very much geared towards the tourist, but let’s face it, if you’ve got such attractions as Romeo and Juliette’s houses, a 2000 year old amphitheatre that is still in use today and a system of medieval fortifications that are still very much intact, people are going to come in droves to stay. They have the usual open buses and little tourist trains wandering around the cobbled streets but we chose to just use a map and the iPhone to research the various places we visited. If one had the chance to visit only one place in the World for 30 minutes, the Piazza Bra would have to be on the list to consider. This wonderful huge plaza is surrounded by lovely buildings and numerous eateries, making it a great place to simply “hang out”. 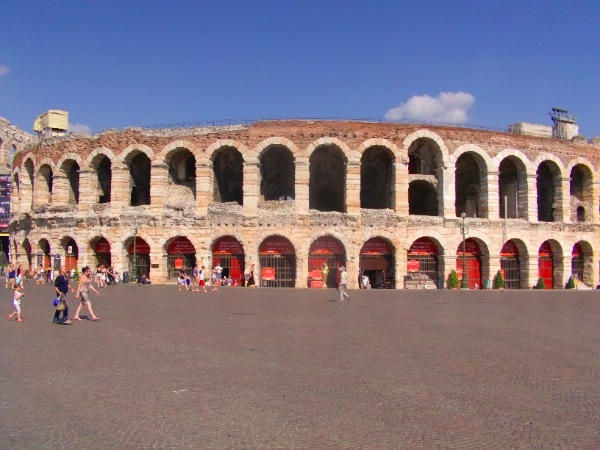 The plaza is dominated by the Arena di Verona, a huge Roman amphitheatre that was built in 30AD. It is still in use today and can seat up to 22,000 people, hosting opera, rock concerts and all manner of entertainments. A small section of the original outer wall remains, another tier higher yet again than the top seating tiers but the rest of the outer ring collapsed in an earthquake in 1117AD. We wandered through the Piazza Bra and on down through the main shopping areas, stopping for a wonderful pizza lunch. The search was on for a new SIM card. My Spanish one had run out but strangely, Christine’s was still working, even with data (they said it couldn’t happen). After much searching, we found a TIM 12 card which cost 20€ but gives unlimited Internet in the first month and will work in other European countries. Exhausted, we wandered home, stopping at a fruit stall because of the wonderful cherries on offer and then into a small supermarket for some olives and cheese. We are trying to adopt the strategy of one decent meal a day and tapas type snacks for the other. Our first stop today was the train station, to check out the lie of the land and to purchase a ticket for the trip to Venice. We opted for the regular train that stops a lot because it was so much cheaper than the express and managed to negotiate the ticket machine in only three attempts. 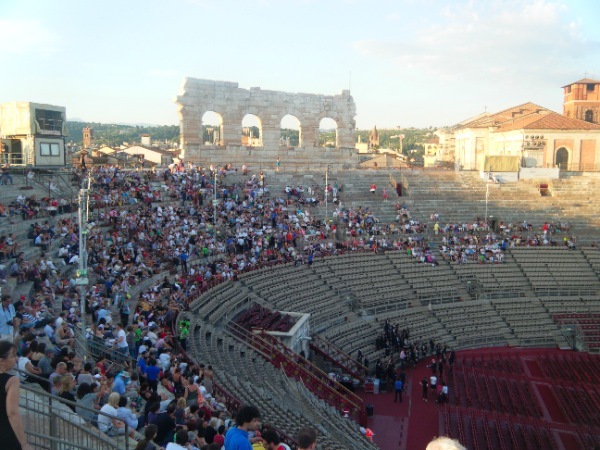 Then it was off into the city centre to buy some tickets to the opera, a must do when in Verona. Along the way, we passed a hawker selling sunglass and watches. We gave the usual “no thanks” before sighting a pair of binoculars, a perfect size for the opera. After much good hearted bargaining and joking, we agreed on 20€ (we were robbed) and then found our smallest change was a 50 Euro. He didn’t want to lose a sale, so he left me in charge of his stall and took off with Christine to find change. They were gone for ages and I sold four watches and three pairs of Raybans for him. Eventually he returned with much laughter and I left him to it. The opera tickets were only 25€ each, cheap seats but then how much should you pay when you are right up the top and sitting on old marble steps. We are going to watch Don Giovanni by Mozart, which is at least has the odd decent tune to it (you can see I love opera), but the atmosphere should should be fantastic. This is part of the current opera festival, with six operas running over the summer months. Last night was Aida, and a large section of the Piazza Bra is covered with huge Egyptian sphinxes and Pyramids that make up the massive set. Another target was Juliette’s house, well preserved 13th Century house and quite fascinating. The entrance way was absolutely covered in graffiti, as thousands of lovers have left their marks on these famous walls. They even proved five or six telephones on the entrance, each bearing two hand pieces so visiting lovers can speak directly to each other and utter words of eternal devotion. All this is very crass but wonderful none the less. Remarkably, the only real feature on the front of the house is a stone balcony. In the courtyard below, there is a bronze statue of Juliette and popular rumour has it that good luck can be obtained by rubbing her right breast. I tried this with the woman next to me and she slapped me back for good luck. After much searching, we finally tracked down Romeo’s house, only a few streets away but difficult to locate. While there were huge crowds at Julliette’s house, Romeo’s was deserted, with only a small sign on the street signifying its importance. Typical! The woman gets all the attention. We tracked down a travel agent, although they seem to be rather scarce here. This one, the GiraMondo in Via Roma, was very big, and a very efficient and pleasant young man managed to get us some tickets on a ferry crossing the Adriatic from Ancona to Split next week. This is something we had not been able to do on the Internet because we just got too confused and unsure of what we were doing. He made it all work for us. Sometimes, it is best to go to a professional. We strolled to the River Adige, a strange fast flowing river that would defy attempts to navigate of swim. I assume it is coming from the nearby mountains. Then it was a lunch of melon and ham, followed by the most wonderful tortellini with ricotta and spinach. Christine is getting inspired and keeps talking about getting back to her kitchen to emulate all the wonderful dishes we have encountered. On our way home, we toured the amazing Castelvecchio, a medieval castle built around 1350. Once again, many sections are largely intact and just wandering around the grounds and across the bridge is a great experience. We managed a few hours of rest to get ready for the opera and to continue the never ending job of researching somewhere to stay on our arrival in Croatia next week. A hotel shuttle bus took us into the city for the opera, with arrangements to pick us up afterwards. It serviced three hotels and there were quite a lot of people going, the long opera season drawing many people from all over Europe. Once in the Arena, we found some seats, not difficult because we were still an hour and a bit before the start. We had bought the cheap seats, up high and just had to find a spot on the marble steps. Bearing in mind that these steps are not all that new, some were a bit worn, in fact, all were worn down 5mm or so over the ages except where they joined, perhaps because people didn’t like sitting on the join. This meant a ridge, that was definitely to be avoided. Four hours later and every square centimetre of an ancient marble block was to be avoided by the buttocks. We were given the chance to rent a cushion for 3 Euros but proved how tough we were by refusing, a decision we very much regretted. In fact, we were to remember our night at the opera every time we sat down for several days. The steps are quite broad and the idea is that one sits on the edge and uses the first half of the one below for foot room. This system fails if some uncouth person takes up the whole space and leans back against the next step or if people bring their own giant cushions to lay out and claim territory. It seems there are inconsiderate people everywhere; it reminded us of a day at the cricket. Below us were the rich people, on their booked seats, at least they were rich before they paid for the tickets. Our seats were 25€ while the good ones were 185€. We soaked in the scenery as the crowd grew and I found myself wondering at the many millions of people who had sat in this arena over the years and the type of performances they had witnessed. The one remaining part of the original outer wall towered above us and glowed in the setting sun. It was quite incredible. Three steps below us was a row that had to be left vacant right around the arena to allow traffic flow to the exits. As the crowd grew and places became hard to find, lots of groups thought they had suddenly found an excellent spot and set up camp on the broad vacant stretch, and we watched with great amusement as they all got moved on. One guy acted like a puppy that didn’t want to walk and just sat for a while, ignoring everything until reason prevailed and he slunk off dragging his lower lip. My first thought when the opera started was “Damn! We are too far away to hear properly.” but this was not really the case. I guess we are so attuned to amplified performances, we forget that natural sound music needs to be really listened to. However, this was an audience that had come to listen and in a very short space of time, I realised that I had adjusted and the volume was fine, especially when the women were singing. All over the audience we could see the glow of tiny torches and iPads as a huge number of people followed the score from books or electronic devices. Unfortunately, there was also the occasional flash, despite the warnings that filming of any kind leads to expulsion. The audience was actually so well behaved that when someone farted (a really good one) behind us, there was nothing more than a muffled giggle, although looking around, most people were working hard not to lose it. Another highlight came when a cat emerged from one of the entrance tunnels, panicked in front of 20,000 people, and dashed out into the posh seating area. Of course, we could watch its progress as it ducked and darted from one row to another, but the people down on the flat area would not have been able to see it until it appeared at their feet. It was getting really agitated and not to be trifled with. Eventually it found itself back near an entrance tunnel and mercifully escaped. Another break came as a few spots of rain began to fall, not heavy but definitely a worry. The orchestra took no risks with their instruments and half way through an important scene, packed up and scurried for cover. The singers stayed longer but had little choice and the audience waited twenty minutes for the show to resume. The last drop actually fell as the orchestra left but then later, as we left the arena, we found that significant rain had fallen just outside in the Piazza Bra. 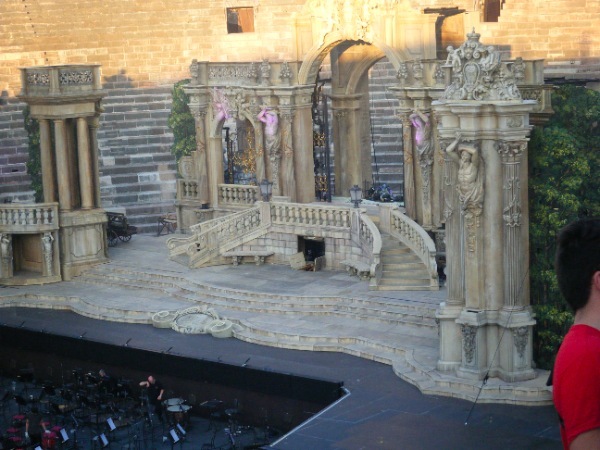 The performance was excellent and the set was unbelievably grand. At one stage, I counted more than 100 people on stage, all brilliantly costumed. From out vantage point, we could observe some back stage activity and the organisation was staggering. What killed us was the length. The show started at 9:15pm and finished at 1am, which meant that we didn’t get home until 1:30am. Given that we didn’t understand a word (we at least knew the story), the show could have been 2 hours shorter and we would have loved it. If Mozart was still around, I’d email him with a few suggestions for which bits to chop out. I think we can tick “opera” off the bucket list. We had a train ticket booked, departing Verona at 10:15. Because we’d only gotten to bed at 2am, we decided to delay and catch a later train at 1pm, possible because the tickets are fully flexible. That gave us time to have a later breakfast and pop back to bed afterwards for a bit more shut-eye. While waiting for the train, we sat on our designated platform in a lovely cool breeze and watched trains come and go from many parts of Europe. Announcements blared at a steady rate as they often do in such places and once, and only once, there was an announcement in English about some train or other. At one point, Christine thought she had heard something about Santa Lucia, our destination in Venice, so she scuttled off to check the boards. This was a good thing because our train proved to be on a different platform altogether. Once aboard, a couple of young Ukrainian girls asked us to confirm their ticket and destination, choosing us because they could speak some English. We pointed out that they had not validated their ticket using the little yellow machine on the platform and there is an immediate 200€ fine for this offence. Even ignorance by a foreigner is no excuse. One girl took their combined ticket and sprinted down the platform to a machine. Our doors then closed and another girl started screaming for her friend. This was just like us in Paris. The first girl validated the ticket, jumped on another carriage and came down through the train to reassure her friend that she was still alive and the train set off. We travelled through unremarkable country, mostly rural with a few scattered industries. The odd low mountain range appeared in the distance and even a tiny castle perched on a hill. Having chosen the cheap train, it stopped at every station, sometimes waiting for other trains to pass. Still, it was comfortable and only took a couple of hours. 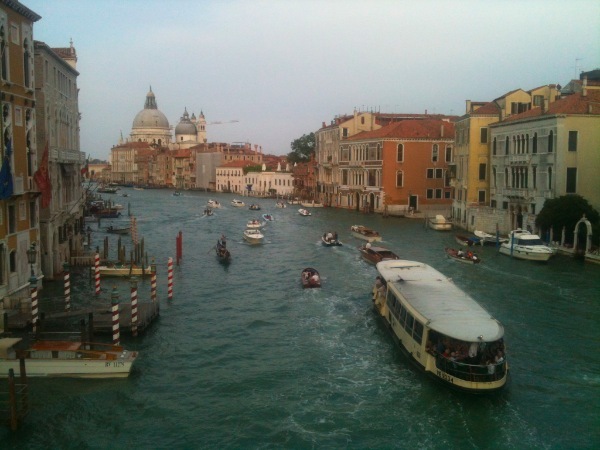 As we got out of the train at Santa Lucia and walked straight out of the station onto a canal, we realised that “We were in Venice!” It took a moment to soak in the romance and excitement of it all. But then the reality hit home. All around us was chaos. Thick crowds of people occupied most paved areas. Long lines of people were queued up at the numerous ticketing booths for tours, water taxis and canal ferries and that was the organised part. 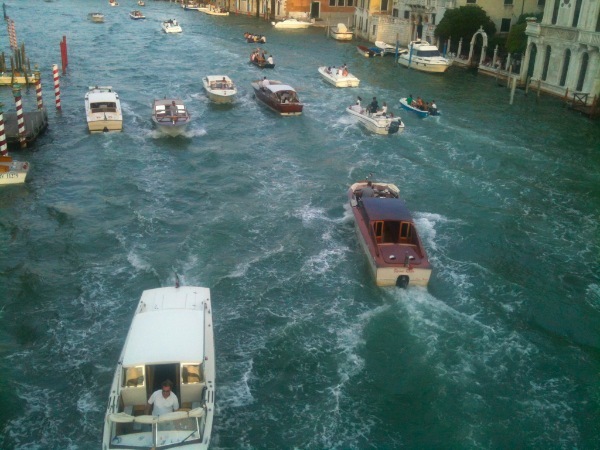 The Grand Canal was bedlam, with taxis manoeuvring waiting for custom, ferries (Vaporetto) pouring in and out of docks at a great rate and small commercial craft delivering things were seemingly meandering at random. I’m sure everyone knew what they were doing but it was worse than Hillarys boat ramp in the crayfishing season. Christine joined the queue to buy some tickets for the Vaporetto while I guarded the bags. I had a bit of a hissy-fit when the ticket office said they couldn’t change a 50€ note (who where they kidding) and insisted on a card to buy two tickets to go 2kms down the canal. Travelling on the Vaporetto is about as romantic as mowing the lawn. Half the passengers have luggage with them but no one thinks to be considerate of others’ needs and given that you have mere seconds to disembark at each stop it can be quite a hassle. However, we got off at the St Angelo stop on San Marco and used the cryptic directions supplied by our host to negotiate numerous narrow laneways, cross a tiny canal and locate the Church of St Stephano, opposite our rooms. We’d been supplied with an access code and room keys were waiting on a table in the hall so we were soon up two flights of stairs and into a room. What! No bathroom? Not happy! Our “private” bathroom proved to be across the hall, very inconvenient for those midnight calls. The aircon was barely coping, perhaps because its tiny gains were offset by the heat pouring off the back of the silly little bar fridge. This looked like being our worst accommodation, even though it is by far the most expensive at around $A200 a night (cheap for Venice at this time of year). We dumped our stuff and ducked out to the piazza, anxious for some air and cool drink. Once again, the prices of everything seemed to sky-rocket. As Christine said, “At least we can say we’ve seen Venice then get out.” On the plus side, everything around us is wonderfully Venetian. All the scenes and sights that we have seen plastered over plates, curtains and bedspreads all our lives are there for the viewing at every turn. Walk down any street or along any canal and it is a true visual feast. Even the crowds are civilized once you move away from the Grand Canal by a block or so. In our area, the ground floors are mostly shops, ranging from small delis to the most wonderful array of specialist shops, all of which put in a huge effort with magnificent window displays. We paused at a art supply shop with a fantastic array of pigments in the window, strolled past shops specialising in tiny packets of herbs and spices and another selling beautifully crafted brassware. This all makes a change from the endless rows of clothing boutiques in other cities. We had a pasta meal for dinner at a nearby eatery then strolled around the local streets and piazzas as the day cooled. 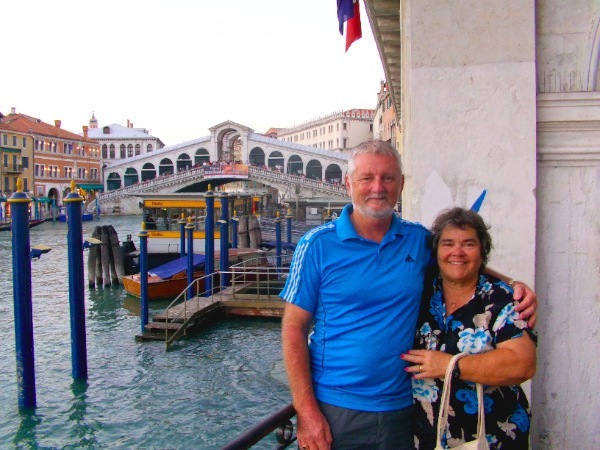 While trying to find an ATM, we came across a couple from Hillarys, showing what a small World it really is. Mind you, an Aussie accent carries a long way across the piazza. Breakfast was an ordinary affair, satisfactory without being spectacular. 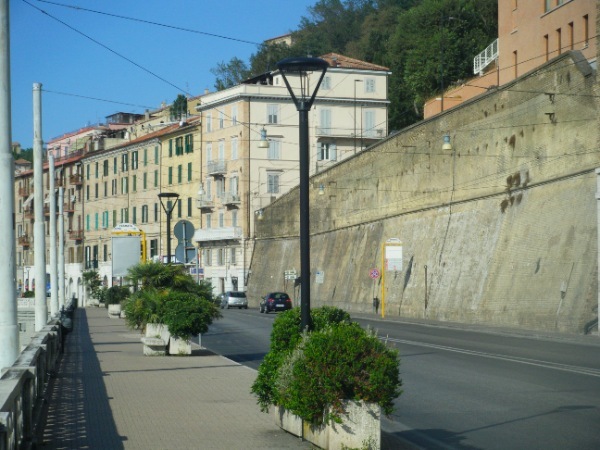 After breakfast, our first task was to explore the possibility of walking back to the train station from the hotel with our baggage on trolleys to avoid the 14€ cost and the difficulties of the Vaporetto with luggage. 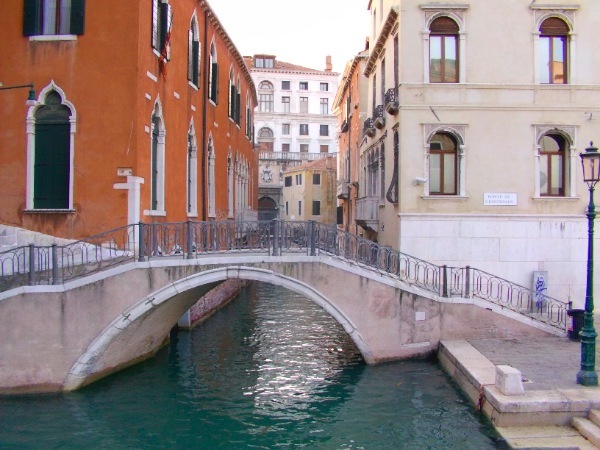 Looking at a map, we had two choices; we could cross the Grand canal then cut straight across San Polo then re-cross the Grand Canal; or we could follow our side of the Grand Canal around its long bend. We opted to try the first method, exploring sights along the way. We crossed the famous Rialto Bridge, fighting the crowds of people taking photos and posing like lovers. You have to put on a really mean look so no-one stops you and asks you to take a photo of them. The next point of interest was the fresh markets, a fascinating place full of wonderfully clean fresh goods and an incredible fish market. If people in Perth make claims that we have access to excellent seafood that the rest of the World envies, don’t believe them. This place had variety, quality and very low prices. We continued on, trying hard to follow a paper map and the iPhone. The problem here is that only about a third of the lanes have names. Moving across San Polo reminded me of a game of chess where both players are down to a king and two knights. It was forward a bit, turn left, forward a bit, turn right and so on, until we gradually neared our destination. Every so often, we had to cross a bridge over a tiny canal. All of the bridges had steps rather than a ramp over so we soon decided that walking with the baggage on trolleys was not on. Eventually, we emerged from the maze dead on target at Santa Lucia and rested up in a little Pizzaria for an orange juice and to read about some of the things we had encountered. This put us right in the old Jewish ghetto and we read about some of the past mis-treatment going back to the 1500s. So harsh were the conditions, that Napoleon had the walls and gates of the ghetto torn down when he invaded Venice in 1793. As in other European cities we’ve visited, monuments to the holocaust and the forced displacements are also very much in evidence. We walked back to the Realto Bridge via the other bank, and this time we found the going easy, although crowded. Much to our amusement, we saw that the route was clearly sign posted to the station. Some of the bridges had a ramp supplied for those towing luggage and this was the final determining factor in us deciding to walk back the following day. Lunch consisted of a wonderful rolled up pizza type thing and a beer. 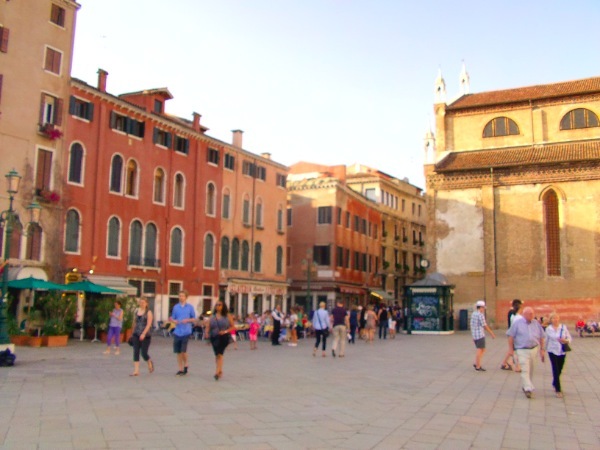 The places along the main walking route between St Mark’s Square and Santa Lucia station are so crowded that they are forced to drop prices a little to compete and so, while still expensive, are at least affordable. From the Realto, we pushed on to St Mark’s Square (San Marco). This is possibly the most photographed square in Europe and an absolute must see. Having said that, we stayed a bare five minutes, deciding to get up and have a pre-breakfast walk in the morning. It wasn’t really possible to appreciate the square or the buildings with the throngs of people milling around. There had to be in excess of 10,000 people and things were really silly. We’ll see it with the morning light. It takes a long time to walk anywhere in Venice, mostly because we keep stopping, attracted by the shop window displays or simply to pause and absorb the atmosphere of a piazza. Hanging out on a bridge over a canal is also terrific fun, especially in the evening when the gondolas are out with lovers afloat. After a bit of an afternoon rest we headed out again as the evening cooled to watch the passing parade. We spent a good hour on a bridge over the Gand Canal watching the water traffic. Venice was celebrating a major festival, with family groups all heading for St Mark’s Square in boats bearing decorations. Every now and then, a corporate effort would come by, with three or four rowers propelling a long craft bearing eight to ten people all in matching T shirts and loaded with lots of eskys. Some boats had tables laden with food and everyone was in a very jolly and festive mood, which was good because there were numerous near misses. I failed to work out any actual system for where boats could travel. It just seems as though you go where there is a space and avoid the ferries if possible. The occasional gondola bobbed by, carrying a couple of terrified looking tourists as they rocked and rolled in the wash of the other boats. It was excellent entertainment. “I’m not Aussie, I’m Australian,” came the frosty reply and a look like she had something stuck up her behind. “Yep, I’m an Aussie too,” responded Christine, maintaining her composure. I nearly threw up. Eventually, we left the bridge and took a table in San Stefano Square to have a pizza and drink. We ordered off the menu of Spritzas. These mixes of wine, soda and another ingredient looked inviting but we couldn’t really get a handle on what was what because the waiter had almost no English. In the end, we settled for a red one. What ever it was in it was about as bitter as battery acid. I managed two sips but Christine gave up after one. What a bad taste. The waiter seemed very put out when we abandoned them and called for a beer but then this particular waiter seemed easily put out. We failed to last the distance to stay up and watch the fireworks. 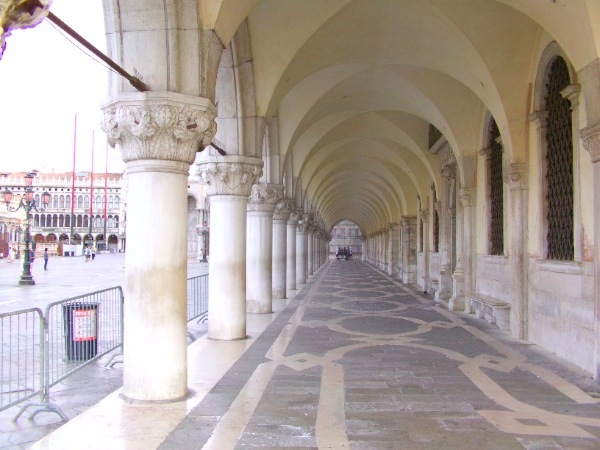 As planned, we got up early and negotiated the tiny alleyways and lanes through to San Marco Square to see it in all its glory without the crushing crowds. Along every street the cleaners were at work, scraping up the remains of the night’s festivities, of which there was a mountain. Around St Mark’s a few sorry looking souls still sat around tables holding their heads as people do all over the World after a festival. The aroma of stale beer and urine added nothing to the scene but at least we were able to wander the square at our leisure and take photographs that didn’t include the heads of people we didn’t know. 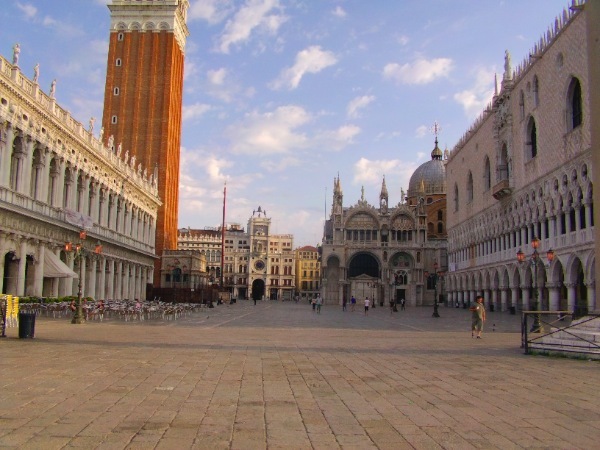 Some parts of the square are screened off and under restoration, an ambitious project to stop the now common problem of inundation as both the sea level rises and Venice sinks. A low wall is being built across the front of the square and the many underground drains modified to stop the tide coming in through the network of pipes and tunnels. In some places, the square is being shored up from underneath and pushed upwards. Just knocking it all down and starting again doesn’t seem to be an option. try to break wind as you finally get around slow moving stragglers and if you can’t, pretend to anyway. Once at the station, we found the right train, a fast train to Rome that we would take until Bologna, then on to Ancona, a small port city in middle Italy. The trip to Bologna was only an hour and a half and passed easily, the train being comfortable. Surprisingly, the train was full, so we were pleased that we had booked tickets a week in advance. The Bologna to Ancona train was older, slower and absolutely stifling. Sitting for 15 minutes waiting to go was getting quite uncomfortable, not helped by the fact that it too was nearly full. It barely improved as it began to move, suggesting that the air-con was not working. One guy behind us had the cheek to question this with the conductor, who responded by having a huge fit. He yelled, probably swore a lot, went red and pushed his face right up to the poor passenger, who did his best to respond politely. The whole carriage was mortified. It was a real John Cleese effort and I’m sure it didn’t come from the TrenItalia manual of customer service. Later, another conductor came through and opened some windows, followed by a third, who offered passengers the chance to move carriages. By this time, the open windows had done wonders and we elected to stay put, meaning that we could stretch out and have two seats each. The first conductor seemed to get banished to another part of the train, probably to do a compulsory unit on customer relations. Our next visitor was the food and drinks man, whose only English was “Ah, English, Si!” and then continued to pretend that we could speak Italian. He became our best friend and spoke at length to us about something or other. If he was secretly making fun of us he at least did it with lots of cheer and good will. We had almost no idea what was going on but managed a ham and cheese sandwich and a beer each. As we headed South, the line followed the coast, and we passed kilometre after kilometre of low cost seaside resorts, many just extended caravan parks full of tents, caravans and Winnebagos. The beaches were packed. This was definitely the Italian Riviera el Cheapo and looked very inviting to us. Each station saw a passing parade of passengers, some bothered by the air-con and others staying with the warm conditions. We alighted at Ancona, emerged from the station, and there, right opposite, was our Fortuna Hotel. It was beautifully airconditioned and generally well-appointed. The rates, after Verona and Venice, were ridiculously cheap, but then anything is compare to them. We settled in then headed back out to explore. While Ancona might have been one of the major ports on the Adriatic during Greek and Roman times and a bustling port during the middle ages and Renaissance, it is well and truly dead on a Sunday afternoon in 2012. Nothing was open. There were a few flea-market stalls selling collectables but otherwise even the kebab stalls were closed. We walked a little way into the port itself and saw enough of the town to realise that it was probably a city worth visiting for its history. 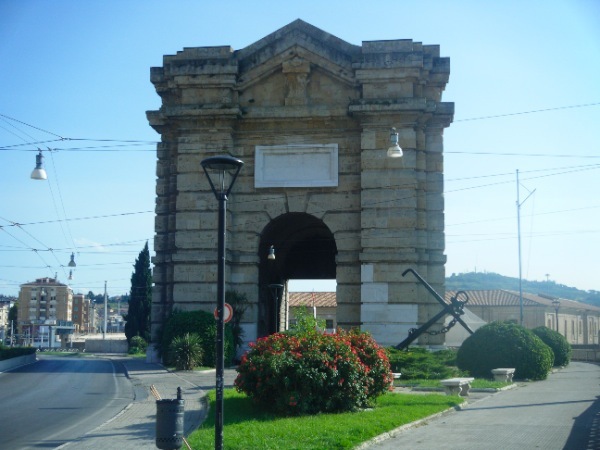 A wonderful triumphal arch (yes, another one) was built in honour of Emperor Trajan in 111AD and the old city that climbs its way up the hill looks very well preserved. We walked around in an old fortified military establishment to the central courtyard which was being prepared for a performance, part of an extensive cultural season featuring classical concerts and outdoor plays. Something would have to bring the inhabitants out because there was very little traffic and the streets were close to deserted. Unfortunately, we lacked the energy and the leg strength to push on and explore the ancient Roman amphitheatre, the numerous churches and piazzas. I did pick up a brochure so that will have to suffice. Fortunately, we found one small pizzeria near our hotel that was open and doing a good trade due to its monopoly on the market. We ordered several great slabs of delicious pizza at 1.50€ each and some cold beer. It went down really well. While I don’t object to eating pizza, we are looking forward to finding something different that doesn’t cost an arm and a leg. In the same block as the pizzeria were Indian, Chinese and French restaurants, with a Sri Lankan one further on but all closed on Sundays. Perhaps Perth is not so backward after all.